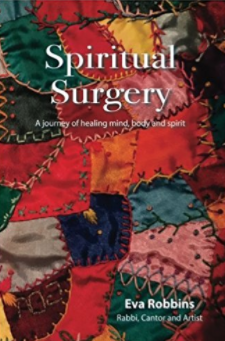 Thrilled to announce that Rabbi Cantor Eva Robbins’ book, Spiritual Surgery – A Journey of Healing Mind, Body and Spirit, is now available and just in time as we come to study the creation of the Mishkan, the traveling Tabernacle that accompanies the Israelites on their journey to the Promised Land. After an extensive overview of the rabbinic commentary on its meaning and importance, she reveals a new pathway to understand the impact both on the people who created it and on all of us, inheritors of its potent power. The Bible, rich in stories of the ancients, can be studied and understood on many levels and Rabbi Eva demonstrates how one of the key narratives is pregnant with meaning and significance. She opens our eyes and our hearts to potentiality and perhaps even a new pathway to healing. This book, along with her meditation at the conclusion, will open your heart and your soul to the transformative power within. It is available on Amazon and she can be reached at nvayshlm@hotmail.com.